My adventures in scrapbooking started about eight years ago when my sister-in-law Jeanette made me go to a scrapbooking party. I had fun while I was there, but didn’t really get into it. Regardless of my lack of enthusiasm, I purchased an 8.5 x 11 album and started a “Family Wedding Album” which would feature my sibling’s weddings. 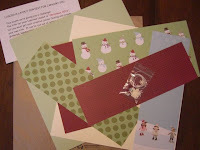 I did most of my scrapbooking at Jeanette’s house as she had all the awesome tools from Creative Memories. I scrapbooked all the photos for my sister’s wedding - and then I was just done with it. Sure it had been fun, but I didn’t have any cutting tools of my own and I wasn’t excited enough about it to buy any. I forgot about scrapbooking until about three years ago, when I noticed Dollarama had an amazing amount of scrapbooking supplies and stickers. Maybe I did like it after all, I just needed the proper tools. With John’s encouragement, I spent about twenty dollars on neat scissors, stickers, and assorted papers; enough stuff to get me going on a few pages. I even went to a department store and picked up a 12 x 12 album. I was ready to roll. I did a few pages for my “Family Wedding Album”, this time working on my brother’s wedding. Something clicked and I was having a lot of fun with it. I also did a few pages for my 12 x 12 album, and fell more and more in love. I realized that scrapbooking combines four things I love: photos, organization, creativity, and (usually) TV on DVD. It is a winning combination for hours of creative fun! So for the past three years I have been thoroughly obsessed with scrapbooking. Beyond the initial supplies I picked up at the dollar store, I have since collected Creative Memories cutting tools (ovals and circles), three paper trimmers (two with strait lines and one with squiggly), a photo corner rounder, square punch, star punch, and countless other tools, papers, and card stock. Scrapbooking can be expensive when you are first starting out (as are most hobbies), but I now have an adequate amount of tools and materials, that all I need to maintain my hobby are photos and accents. To keep costs low, I always purchase my photos during a photo sale, never wanting to pay more than .10¢ per photo. In May I printed 130 photos during a .10¢ sale, and I currently have 101 more photos waiting to be printed for when the next sale comes around. I love photos as much as I love photo deals! I have a pretty good sticker/embellishment collection, but I’m always looking for new accents at the dollar store, or the department store if there is a deal. They don’t always make stickers for every page idea, so I sometimes make my own embellishments, either out of card stock, or other crafty materials. I recently used a glue gun and some felt to make accents for a page I couldn’t find the right stickers for. I got to be extra creative and using a glue gun is one of my favourite things to do. Hot glue rules! I’ve come a long way from thinking I didn’t like scrapbooking. I completed my “Family Wedding Album” last winter, which is good because the most recently married sibling got married over five years ago, so it was about time. I also finished my first 12 x 12 album, which gave me an amazing sense of satisfaction. Forty-two pages of cutting, cropping, positioning, accenting, titling, journaling...it really is a lot of work when you think about it. I’ve also completed a baby book for a friend, discovered card making, and started three new albums. I can’t wait to see how they turn out!